· There are so few buildings with fully meshed ground conductor wiring that we may as well consider that such venues do not exist. Does this mean that it is therefore impossible to design an interference free system for audio? Luckily, the answer is a definite NO. The purpose of this article is to review a series of relatively simple techniques that can be applied to any non-EM compliant component and implant mesh-ground islands within any venue where audio equipment needs to be used. None of these techniques are particularly new. If fact most of the techniques discussed below have been known, tried and tested for more than fifty of our Earth years. No doubt some of the techniques will appear alien to many audio engineers (which is why the take-up of EMC design methods has been so slow in this industry), but all have been in use by the computer, instrumentation and RF sections of the industry for a very long time. I can almost hear the in-rush of air, as audio experts in all parts the world take in a deep breath to shout at me: “But computer, instrumentation and RF systems don’t have the low frequency noise problems that audio systems have!” Well, I am here to tell you that all electronic systems can and do suffer the same low frequency noise problems that are regarded by many as unique to the audio world. In fact, it should be a matter of amazement that audio engineers did not find the solution first, since it is much easier to trace a fault if one hear it! Instead, audio engineers found a palliative, leaving the cause of low frequency noise problems in place . Processor controlled circuits are now widely used in and around audio systems - digital control of analogue; digital-audio recorders; digital audio processing; computers for editing and controlling audio equipment. 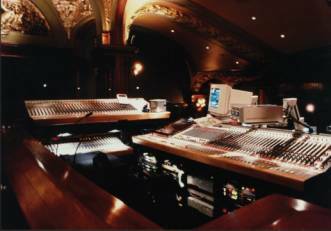 In live sound, interference problems are exacerbated by computer controlled lighting; power flying and stage machinery. All these components have the ability to produce high levels of radio frequency interference with a very wide band width. The lower harmonics of processor clocking circuits carry considerable energy, and can be demodulated by analogue circuits, and since all cables in a system tend to act as antennas, we must assume that any interference generated can be distributed to the rest of the system. This means that here is a potential for interference between sub-systems. External interference from VHF/UHF wireless transmissions are an increasing problem, plus almost everyone now uses a cell telephone (apparently most of the time). Common sense would therefore suggest that we need to design our components and system wiring to give us good RF shielding. ii) Any gaps or apertures anywhere in a shield will ‘leak’ radio-frequency energy and compromise shielding. Of course, if a cable shield is only terminated to the equipment’s enclosure (Faraday cage) at only one end it cannot carry a longitudinal current, and the unterminated end will of necessity create a large gap in the shield. As we audio engineers know, this instruction flies in the face of everything we have learned about subduing the noise problem we refer to as a “hum loop”. For years, we have been lifting one end of a cable shield (the palliative I was talking about) to stop the hum, without realising that we had left the “hum loop” generating mechanism in place. Even worse, no one bothered to do a proper check to find out why systems produced hum in the first place. We were always amazed, that after spending several days removing the hum, it would suddenly reappear the moment ours backs were turned. And we have all been so focused on the audio frequency band width, no one had stopped to consider that lifting one end of the shield reduced the shielding effectiveness of our cables to just a few hundred kHz, at best. Another less-than-well understood fact is that the AC power supply infrastructure is a major contributor in interference collection and distribution. The increasing use of switch-mode power conversion and phase-angle power control for lighting and stage machinery has recently made matters much worse. Since all system components are effectively connected together by the power wiring, we had better learn how best to control the problems associated with this, since we really can’t do without AC power. There is also the important aspect of personnel safety and equipment protection. 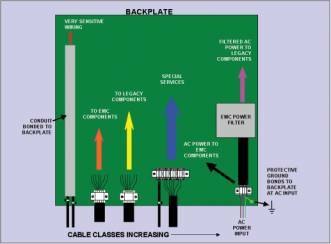 All AC power distribution systems are now required to have a safety earth conductor installed. I shall call this the protective ground from here on, because as you will see later, noise and interference control is much more effective when we use the same earth conductor system for everything: personnel safety; equipment protection; signal reference; lighting protection. The primary goal for an earth/ground system is personnel safety and the protection of installations against damage. In early electrical systems, the main protagonists were identified as power system faults and lightning. Under these conditions, safety and protection was achieved by providing a conducting path to the soil for the currents produced by such phenomenon. The development of electronic systems somewhat confused the issue of earth/ground in that individual circuits did not necessarily need a connection to the soil. Earth/ground for an individual electronic circuit being a reference conductor for all internal circulating currents to return to. While some parts of a system did needed to have a connection to the soil, other parts had an improved performance when isolated or left floating. Today, we need to consider four conceptual earth/ground requirements: safety, functional, and EMC. In any system, all four earth/ground requirements are interrelated. Connection of the exposed conductive parts of an installation to the main earthing terminal of that installation. While local regulations must take precedence, there is wide agreement amongst international regulatory codes that exposed conductive parts of equipment that may be touched by personnel, and which could become live in the case of a fault, should be bonded to the protective earth/ground conductor system. Equipotential bonding, in this context, is a way of assuring that exposed metalwork in a given working zone is at substantially the same potential under normal operating and fault conditions. Such voltages are expected to be safe (usually considered to be < 50V rms), but are very rarely zero. Equipotential bonding is designed to protect people, but not necessarily equipment and wiring. In large installations there may be more than one equipotential zone. Voltages between zones may well be large and undefined. Special precautions are necessary for signal wiring (such as local area networks) that cross such zones, to prevent them from importing potentially hazardous voltages. Overall protection against electric shock should be a combination of earthing/grounding and automatic disconnection of the supply under fault conditions. It is therefore important to co-ordinate the method of protection (fuse, circuit breaker, RCD) with the installation’s earth/ground fault impedance, so that disconnection occurs quickly enough to prevent electric shock. The physical dimensions and hence the resistance of the earth/ground protective conductor is therefore determined by the prospective fault current available from the rest of the system. When protective multiple earthing/grounding (PME) schemes are employed, the protective conductors are likely to take substantial continuous currents, even when the supply is off, as a result of circulating currents in the bonding network, and may need over-rating. In this case, we are concerned with currents at low frequencies, where resistance rather than inductance will determine the conductor impedance. This is a term used for conductors that have the specific job of both relating the voltages in one circuit to the voltages in another piece of equipment and for preventing adjacent but galvanically separate circuits from ‘floating’. Such conductors must be distinguishable from the protective Earth/ground conductors by using a different colour code. While functional Earth/ground conductors do not need to meet safety regulations, the threat of circulating currents and potential differences between different zones may place practical constraints on the use of such conductors in large systems. The specification of equipment signal circuits should be designed for the maximum common mode voltage, which should be the same as the potential difference between zones. If the actual voltage can exceed the equipment’s common-mode voltage rating, then a Common Bonding Network (CBN) should be implemented. This may not be practical in some existing installations, in which case, galvanically isolated circuit interfaces are the normal solution. A building that contains an electronic system must be provided with a low impedance connection to the soil for currents induced by a lightning strike. Recent research has shown that a lightning strike can punch through building walls if a more direct connection to the soil exists within the building. Cloud–to-cloud strokes can induce very large voltage surges in cable systems, particularly when the cables are running parallel with the soil. Thus in multi-story buildings, better protection can be achieved by bonding the lightning rods to other earth/ground conductors associated with the building fabric (see Chapter 9 of ). Various national and international standards for lightning protection have been published throughout the world, so local regulations must take precedence. A conductor system designed specifically to ensure that interfering voltages are low when compared to the desired signal and that incorrect operation or excessive emission does not occur. Since there is no explicit safety or operational function, and electromagnetic interference can occur over a very wide frequency range, an EMC earth/ground system can take advantage of the distributed structural components that already exist in the building - the chassis of electronic sub-systems, equipment enclosures and panels. Its overall performance is related to its physical geometry, which means that its design must be related to the mechanical design of the structure, the installation techniques used as well as electrical engineering principles. · A low transfer impedance path to prevent common mode currents converting to differential mode. A perfect equipotential area or plane, where there is no difference in potential between any two physically separated points is highly desirable for any earth/ground system. In an EMC context, no noise voltages would exist between these points so that no interference is injected into a system that is earthed/grounded to these two points. Perfect realization of such an area is in fact impossible, but a good approximation can be achieved by using a highly conductive plane. The back plane of an equipment cabinet and the meshed floor of a computer room are two good examples of such a plane where the earth/ground impedance is dominated by resistance up to the highest frequency which is of concern for EMC purposes. Any practical structure has a non-zero impedance between any two points, and when a current passes through such an impedance a voltage must be developed across it. For EMC, the need is to minimize the interference voltages developed in the earth/ground. Thus a good earth/ground design is one which offers the minimum impedance to whatever interference currents are flowing. If the designer is in control of the earth/ground, it might be possible to use it for a functional return path for a circuit. If there is any doubt about its low impedance characteristics, a separate return conductor should be installed, and paired with the signal conductor, thus minimizing the total circuit inductance. If the circuit must be referenced to earth/ground, it can be done at one point, thereby preventing pollution of the signal conductor by the earth/ground or vice versa. The question of which point to connect to earth/ground is unlikely to be trivial. The earth/ground structure associated with a signal and dedicated return conductor pairing should be designed to provide a low transfer impedance (ZT). Transfer impedance is defined as the voltage developed within the victim circuit divided by the interfering currents flowing within the earth/ground path. Low ZT means that interference currents flowing within the earth/ground – which are, for all practical purposes, unavoidable – transfer the minimum interference voltages to the circuit. A structure which has a low ZT in one direction will also be good in the other, due to the components in the earth/ground being passive and linear. 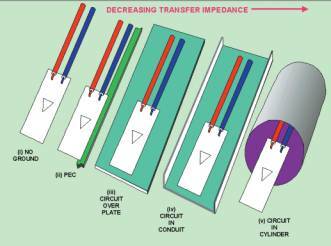 Transfer impedance is a function of circuit and earth/ground geometry. In the near field, its value is affected by the inductive and capacitive coupling between the circuit and the structure and by how these parameters change with separation, orientation and coupled area. (i) Circuit on its own: cannot be described in terms of ZT. (ii) Circuit with parallel earth/ground wire: simple structure with relatively high ZT. (iii) Circuit mounted close to metal plate: ZT decreases as proximity of circuit to plate decreases and width of plate increases. ZT is dominated by coupling from the edges of the plate. (iv) Circuit in ‘U’ shaped conduit: ZT further improved because edge effects are reduced. Edge effects can be further reduced by fitting a lid, or eliminated if lid makes continuous contact. (v) Circuit in cylinder: lowest possible ZT. While impractical for most equipment, coaxial shielding is easy for cables. A solid outer sheath gives the best results. 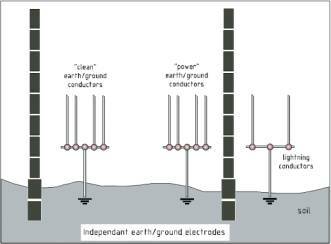 The use of independent earth/ground electrodes is now understood to create a safety hazard. During a lightning strike or when earth fault conditions occur in medium and high voltage power distribution, independent soil electrodes can take on very different voltages, with transients exceeding 10,000 volts. This can cause electrical shock, showering arcs, toxic fumes, smoke, equipment damage, personnel burns and serious fire. This type of bonding is also very poor for interference control purposes. While it is unlikely (these days) to come across this type of grounding conductor topology, I have included this short explanation of why independent grounds are a major problem, because I have had to face this type of system on a few occasions. The large potential differences between different ground points in the system are not only dangerous, but cause enormous problems in controlling low frequency noise and are completely useless for controlling high frequency interference. 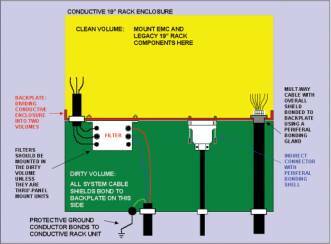 This is most common kind of grounding structure found in existing buildings and installations. Isolated ground networks for clean power, dirty power and lightning protection are bonded together at a single or commoned earth/ground electrode. 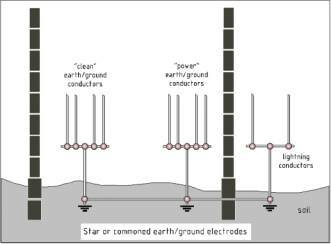 Star grounding eliminates the gross safety hazards of the independent earth/ground electrode system. When carefully installed and the topology maintained, star earth/ground systems are capable of good safety performance at power frequencies. At the frequencies used by today’s instrumentation, control, computing and telecommunications technologies, star earth/ground systems are no longer adequate for controlling interference in a professional installation. (i) The traditional concept of providing a ‘clean’ earth/ground system for communications equipment is no longer viable since many codes require a single point earth/ground bond to the soil for safety, and many manufacturers use earth/ground as a reference potential for signal-ended information technology and communications signalling equipment. (ii) Individual cables, wires and structural steelwork of any practical length must be considered to be effective antennae at the frequencies in common use. This puts severe limits on the effectiveness of star earth/ground techniques for use in interference control or any form of EMC. (iii) Star earth/ground systems are all too easy to compromise accidentally or due to poor maintenance. For instance, consider the installation of a data cable between two items of apparatus on different limbs of the star - many years after the commissioning of the original system. If not done correctly by personnel with knowledge of earth/grounding and lightning protection, a surge event could cause damage to the apparatus and/or fires or electric shock. Similar problems can occur when an item is moved to a new location or when walls or boundaries are moved. 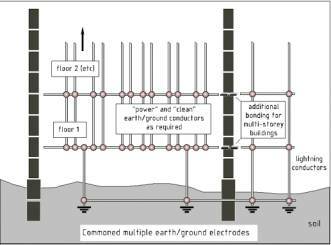 This is the earth/ground bonding method now required for safely in buildings, and is sometimes called a Common-Bonded Network, or CBN (see references  and ). In a complex installation, the CBN needs to be enhanced to create a three dimensionally meshed equipotential system. This is referred to as a MESH-BN (Mesh Bonding Network). Every piece of structural and non-structural metalwork in the building is bonded together. This includes concrete reinforcing bars, girders, cable trays, ducts, deck-plates, gratings, frameworks, raised-floor stringers, conduits, lift (elevator) structures, window and door-frames, and the metal pipe-work used for gas, water, smoke, air, etc to make a highly interconnected system that is finally connected to the lightning protection system (LPS). This highly meshed three-dimensional system is then very highly interconnected to the shields and armour of all electrical cables, and the frames or chassis of every piece of electronic equipment. If existing metalwork or conductors do not exist, large cross-sectional-area conductors must be added to complete the mesh either vertically or horizontally. A minimum mesh size of 3 to 4 metres (10 to 13 feet) is often recommended to help protect electronics from the pulsed magnetic fields (LEMP) generated by lightning strokes occurring within a couple of miles of the site. The main earth/ground terminal for the incoming power supply to the building requires multiple bonds to the MESH-BN. The MESH-BN is used as an integrated earth/ground bonding system for the safety, functional and EMC earthing/grounding. With such a highly interconnected system it is possible to achieve the various aims of safety, signal integrity, equipment reliability and EMC at a reasonable cost, without compromises. An added advantage is that the system is much easier to manage, with fewer restrictions on future modifications. When one is lucky enough to be able to work on a system like this, interference and noise problems are much easier to solve, especially in high-specification pro-audio systems, such as the new Esplanade complex in Singapore. I am encouraging Theatre Projects Consultants to write an article about the system design on this important project. The most common objection to a meshed earth/ground system is that it creates “ground loops” – a phrase that is now historically associated with currents flowing in earth/ground conductors, where they have been found to make serious contributions to system noise. In a system where earth/ground potential differences exist, closing a loop between two such earth/ground points will allow current to flow in the structure. If the potential differences that exist are high, then large currents can flow in the loop. When the conductors in the loop include a segment that forms part of, or is closely coupled to, a signal or low-level power cable, substantial interference can be induced in circuits associated with that cable. When we open the loop, the current no longer flows and the interference disappears – but the potential differences remain, ready to create a similar problem when a loop is closed elsewhere in the system. The principle of removing all ground loops and accepting the resulting high voltages between different parts of the earth/ground system is formalized in the star or single point earth/ground regime. While this type of earth/ground system is relatively easy to implement, and quite successful in simple low frequency applications, it must now be considered to be a retreat from best practice. Interference in today’s systems is usually measured in 10’s or 100’s of MHz rather than Hz. A star or single point earth/ground conductor system presents high impedance at these frequencies, and so isolates the system from earth/ground rather than couple to it. Another serious problem is that larger star systems tend to degenerate into accidentally ground-looped systems as time passes. Sections of the system get modified or updated, requiring a degree of management and control to maintain safety and equipment reliability, that is a burden on the ever-decreasing resources of modern technical departments. A mesh does indeed produce a very large number of ground loops, but they are small in area and under the control of the designer. Voltage differences between parts of the structure are minimized, the resulting currents are low, and the interference possibilities negligible. The safety, reliability, EMC and ease of use advantages of properly implemented MESH-BN systems far outweigh their possible disadvantages. In design situations where it is necessary to group and/or interconnect sensitive components with equipment that has the potential to be a source of interference, it is cost effective to construct a whole area, where the ground conductors are meshed together. A good example would be a recording studio control room, or the mixing position for a live sound system. In both cases, the mixing console (analogue or digital) is likely to be surrounded by equipment racks containing a mixture of sensitive “victim” components and electromagnetically hot “aggressor” components. Figure 5 shows a typically complex mixing position for live sound. A three-frame digital-control-of-analogue mixing console, sits on and is surrounded by rack units containing digital-audio playback machines; digital reverberation and delay units; analogue and digital equalizers; analogue and digital dynamic controllers; three different computer systems for running the show. Since the mixing console is highly interconnected with all the rack mounted components in the area, full shielding is required on all I/O wiring (audio, digital, and control). This may not be quite as simple as it sounds. Many audio components available today are designed with a design deficiency, first noted in an AES Engineering Report by Neil Muncy in 1995, and has become known as the “pin 1 problem” - where the I/O cable shield connections by-pass the chassis/enclosure . I refer to equipment designed in this way as legacy components and later on devote a whole section on how to deal with the problem, when we need to use fully shielded wiring (section 6). However, the basic principle is simple, and this is shown in figures 6 and 7. Figure 6 shows that the main safety requirement is met by connecting the conductive surfaces of all equipment cabinets or enclosures to the AC power supply protective ground conductor. IEC 61000-5-2 , further suggests that the potential differences between conductive surfaces in an area can be further reduced by surrounding the equipment area with a continuous heavy duty conductor known as a Bonding Ring Conductor or BRC. 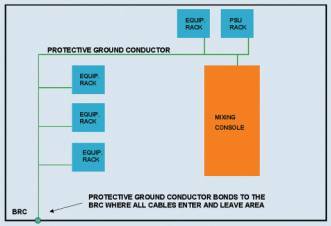 The incoming AC power protective ground conductor bonds to the BRC on entry into the area. When all metal enclosures are also bonded to the protective ground and the BRC, the equipment enclosures form an equipotential zone at power frequencies. This is excellent for safety, and I have found that it is pretty good start for controlling interference too. Since all signal cables in a typical sound control area are electrically long, compared to the wavelengths of possible interference generators (processor clocks and their harmonics; LANs; wireless sub-systems; cell telephones; etc. ), all signal and control cables need to have their shielding capabilities maximized. This can be done by using individual or multi-core shielded cables, and/or conductive conduit in which to run the cables. Remember that cable shields can only provide effective shielding if the interference current can flow in the shielding conductor. Since we have already provided a good low impedance local ground mesh for safety purposes – all we need to do is to bond all cable shields to the metalwork of each enclosure at both ends. Of course, we have now connected the protective ground to the signal ground at lots of different places. But this is a major advantage. The signal cable shields have added a new ground mesh to the area, providing a number of different ground paths of various impedances for use by high frequency interference currents. As long as these currents are not allowed to enter the internal circuits of the equipment in the enclosures, we will have solved most of our local interference control problems. But, to get the best of advantage from the fully shielded cabling, we must try to use 360 degree shield bonding (sometimes called peripheral bonding) at all cable joints and connectors. While the common XLR connectors used with most pro-audio equipment do not allow 360 degree shield bonding, there are now some types that do, and other ways in which we can mitigate this failing. There are times when the RF performance of the mesh ground structure needs to be further enhanced. The method that I have used, with great success, is borrowed from the computer system side of the industry. The basic concept is thus: stand all equipment enclosures on a metal grid; bond all enclosures to the grid (at least once); bond the BRC to the periphery of the grid (at lots of places); bond the AC power protective ground conductor to the grid. Properly designed conductive grids are available, and are sometimes referred to as computer mats. I have had success in one system by using a double layer of “chicken-wire”. There are many audio systems where various parts of the overall system are remotely located. This can mean that there are multiple local ground areas, none of which will be anywhere near the same potential, even at power frequencies. The basic schematic is shown in figure 8. Remote location 1 might be a machine room, containing recording equipment and power supply units, or could represent the stage in a theatre or concert installation. Remote location 2 could be the amplifier racks in a theatre, the recording or broadcast truck at a live concert, or another studio in the same building. The point is that remotely located parts of the same system can be hundreds of meters of cable away from the control position and/or each other, but all have (or at least should have) a common protective ground connection via the AC power supply for safety purposes. One thing that we can be sure of is that Vg1 is not equal to Vg2, Vg2 is not equal to Vg3, and Vg3 is not equal to Vg1. This is due to the inductance of the protective ground conductor which, even if made from cable used by Hi-Fi enthusiasts and costing several thousands of pounds per meter, will absolutely not be zero at any frequency. When we interconnect our signal cables and bond the shields at both ends (for good interference control) – a loop is formed and current will flow. (ii) The magnitude of the loop current might increase, but it is shared by the different cable shields connected in parallel, so the shield current in each cable is low. If the value of the overall loop current is still too high, the current can be further reduced and divided by adding one or more extra conductors between any two ground locations. This is explained more fully in ,  and , and is known as a Parallel Earth Conductor or PEC. When the impedance of the PEC is lower than the impedance of one or more cable shield conductors, the loop current will divide in the ratio of the impedances. In practice, this always means that most of the loop current flows in the PEC and only a small fraction in the cable shields. The work that Keith Armstrong and I presented in , demonstrated that a shield current as high as 5A did not present noise problem for components designed with correct grounding. In practical systems, it is very unusual for loop currents to be so high, that they cannot be controlled by this method. So far, I have not come across one. In a system interconnection where there are some 16 individual shielded cables, you probably don’t need a PEC. If the cables run in metal conduit, one can bond the conduit to ground at both ends and use the conduit as the PEC. But since I have found the main advantage of the Parallel Earth Conductor – it always reduces magnetic coupling at low frequencies and helps to reduce crosstalk - I always put one in, anyway. The cost is small compared to trying to solve a noise problem after the system is finished. I use the term legacy equipment to mean equipment that has been designed and built with inadequate or incorrect grounding procedures. There are many variations on the theme. But in all cases, signal and/or control connectors, intended to use shielded cable, are designed such that the shield connection by-passes the equipment enclosure, and connects the cable shield terminal directly to the 0V or signal common trace on the printed circuit board. Any noise current flowing in the shield conductor is thus injected into the circuit’s ground return conductor and the circuit will reproduce the noise. This is the dominant mechanism by which “hum” or “buzz” noise gets into an audio system – and is the reason why audio engineers adopted the practice of lifting one end of a cable shield. In other words, “hum” or ”buzz” noise, caused by loop currents flowing between two system nodes are only a problem if one or more components in a system use incorrect shield termination methods. If the cable shield can inject current into the electronic circuit, just a few microamperes will cause a loud “hum” or “buzz”. But when the cable shield bonds directly to a grounded chassis, the current flowing must be abnormally high for the noise to even reach the level of the input circuit’s self noise. This is true even for balanced input receivers that have only a modest CMRR (Common Mode Rejection Ratio). · external power supply with no ground conductivity between the psu and the device it serves. By now, you realize that I am not just talking about old equipment. In fact, around 90% of currently available new audio equipment is found to be designed with these short-comings. Others will recognize that it is not just audio equipment that is designed and built with incorrect shield termination techniques. Incidentally, lifting the shield at one end might well stop the hum and buzz noise, but the cable shield has now become a really efficient antenna for any interference frequency whose wavelength is less than about 10 times the cable’s length (e.g. frequencies above 3MHz for a 10 metre long cable). Thus radio-frequency current can be injected into the circuit 0V trace at the connected end of the shield conductor. This current can too easily be demodulated by any of the semiconductors and ICs in the circuit , even supposedly ‘low frequency’ opamps, and the noise reproduced in the output signal from the driver component. Probably the best example of this is the local Taxi driver (waiting in the parking lot), having his call to base reproduced by the club’s PA system. Ah – I see you have experienced that. So, how do we deal with legacy equipment? And we must, because our customer insists on using a 1970’s “XYZ-72” compressor and three of the latest “ZYX-5nnn” reverb units, and we need to maintain a fully shielded cable system. The basic concept is: create a RF buffer zone between the shielded system wiring and the legacy component. In it’s simplest form, this comprises a metal panel large enough to mount the necessary indirect connectors; a set of appropriate connectors; a method for RF bonding the metal panel to the shielding enclosure of the equipment, or (for unshielded plastic enclosures) to the mesh bonding network. The indirect connectors should (ideally) be of a type that allows cable shields to be 360 degree bonded to the system side of the metal panel. There are a number of good multi-way connectors that allow this, but most existing XLR connectors will need some additional wiring. However, we need to end up with all the cable shields from the system side of the wiring bonded to the same side of the metal panel. Some designate this the dirty side. Wiring from the other clean side of the panel goes directly to the appropriate signal and/or control connectors on the legacy unit – except for wiring to any connector pin normally designated for a shield connection. Figure 9 shows that for an XLR connector, pin 1 is not carried through – only the balanced pair conductors. But note that it is best to use a twisted pair for the signal, and carry the twist all the way from the panel to the XLR connector on the legacy unit. What we have done here, of course, is to “lift” the cable shield connections to the legacy unit, but we have kept the overall system wiring fully shielded. 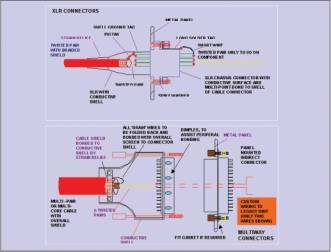 When we use XLR to XLR cables with standard wiring (shield to pin1; hot to pin 2; cold to pin 3), we need to bond pin 1 of the XLR interface connector to the backplate. Unfortunately, the pigtail formed is on the clean side of the plate. Even a pigtail 25 mm (1”) long can be antenna at cell telephone frequencies. The length of the pigtail antenna can be halved, by bonding pin1 to the shell connection inside the cable XLR. However, some people prefer to keep all XLR to XLR cables with standard wiring. What we really need is XLR line connectors with 360 degree shield bonding to the shell. Luckily, such components are now becoming available from at least one XLR manufacturer. (ii) Bond only the overall shield of the multi-way cable to the system connector shell. Use individual shielded pairs from the bulkhead connector right up to the legacy unit connector(s). But, only connect the individual shields to the designated shield pins for inputs where phantom power is required. A variation on (ii) above, can be used for legacy data or control connections. Once again, only the overall shield of the external system cable is bonded to the dirty side of the metal panel. All other conductors in the multi-way cable are carried through to all pins used by the legacy unit. This is required, because many legacy data and control I/O ports use a ground reference potential for signal-ended information transmission. This is the digital version of the “pin1 problem”. So, using this double-shield wiring technique will produce much better signal integrity than may have been experienced the last time you used the same legacy units in a previous system. Unbalanced audio I/O ports will need to be interfaced by using transformers, to provide the necessary ground isolation. The transformers should be mounted on the dirty side of the backplate, wherever possible. · The center-tap of the primary winding on an input transformer should be bonded to the backplate, to help remove common-mode noise. The secondary winding connects directly to the legacy unit using a short length of shielded twisted pair cable, with the shield connected only at the backplate. · The primary winding on an output transformer should be fed from the legacy unit using a short length of shielded twisted pair cable, with the shield connected only at the backplate. The center-tap of the secondary winding is bonded to the backplate. · Transformer shield terminals should be bonded to the backplate. (i) Local earth/ground reference for the internal equipment. (ii) A demarcation zone for increased EM protection. (iii) Shielding from radiated field coupling, to and from internal equipment. This would suggest that we are talking about a metal or conductive cabinet or enclosure – and indeed, this can provide good protection from interference. But in many existing audio installations and touring equipment, rack cases are often constructed from materials that offer little or no shielding. Note that the traditional function of a metal cabinet – to provide a shield – has been found to be less important than the job of providing a good earth/ground reference. This can be achieved by an enclosure that is effectively unshielded, if the bulk of the metal in the structure is designed and used correctly. It is the specification of the conductive structure, assembly methods used for the individual structural parts, and the provisions for cable entry/exit that are the key factors for a good EMC enclosure. But, whatever the type of construction, all cabinets and enclosures must be bonded to the earth/ground mesh. In section 3 we noted that the transfer impedance is a function of circuit and earth/ground geometry. 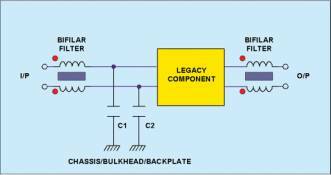 A large flat plate over which circuits are mounted can give the best transfer impedance if a cylindrical or rectangular enclosure is not practical. Many of the available enclosure designs offer a conductive backplate or chassis that can be used as a good EMC earth/ground. For a non-conductive rack housing, this method is essential, if we are to be able to control interference currents associated with signal cables. The mounting of all electronic modules and the terminating of all cable shields, and parallel earth conductors on a continuous conducting surface provides the lowest achievable transfer impedance in practice. Choice of material and the way in which contact is made with the plate is very important since it must carry interference currents. Zinc plating and clamp style cable shield connections are recommended. Any protective plating or passivation applied to the material must be conductive to just a light pressure from ohm-meter test probes. 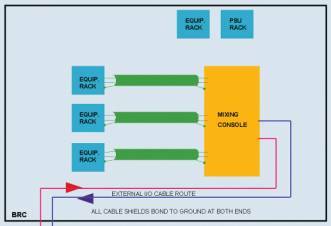 Terminations of shielded cables to the backplate or chassis must be carefully planned and implemented. All common mode interference currents must flow directly through the material and not into the circuits mounted on it. Wherever possible, 360 degree shield terminations should be used instead of pigtails. When using a non-conductive 19” rack enclosure, only the interface connections will be close to the backplate. But the rack unit mounting bars should be bonded to the backplate wherever possible. While enclosure manufacturers can now provide properly designed EMC cabinets, existing enclosures can often be used if care is taken in ensuring that all panels make good electrical contact with each other. This means that paint or other insulating finishes such as anodizing must be removed at the place where earth/ground or inter-panel contacts are to be made. A most effective design concept for equipment enclosures is to provide segregated volumes for circuits that benefit from or need shielding and circuits that do not. The shielded volume is known as the “clean” box and the unshielded volume, the “dirty” box. A single cabinet can be divided into two volumes by using a bonded partition/bulkhead/backplate, or an additional “dirty” enclosure can be bonded to the side of an existing “clean” enclosure. The “clean” compartment contains all the electronics that must be shielded from the external environment, with rigorous control of all apertures necessary for inputs, outputs, control and power connectors. All connections through to the clean volume must be made using connectors that give 360 degree earth/ground bonding, or via effectively earthed/grounded filters (this includes transformers). No untreated cables are allowed. Through-bulkhead filters do not cause problems, but when using chassis mounted filters, the through-bulkhead wires must be kept as short as possible and treated with ferrite sleeves to minimize HF ‘leakage’ across the partition. The main advantage of this method is that the “dirty” volume can be used for most of the field-installed connections. All internal connections can be pre-wired and tested before the system is installed. Thus, most of the good installation practices, so far discussed, are under the control of the system designer and not the installation technician. Coupling of external fields to internal cables, and of local electric and magnetic fields between cables, is directly related to the route that a cable follows around a system. So, when we are able to use a conductive cabinet or enclosure, external field coupling to cables can be minimized if the cables are run close to a well-bonded metal structure, which can act as a low impedance path for common-mode currents. Cables that must leave the backplate or chassis should follow a conductive structure that is electrically bonded to the backplate or chassis. Avoid running cables near to apertures in the enclosure or near to breaks in the bonding continuity, since the local fields around these points can be very high. Segregate cables into different classes depending on the signals or power they carryand maintain at least the minimum spacing between them, as described in the later section on Cable Classification, to minimize the possibility of coupling between them. The most effective way of dealing with a mixture of components that bond I/O cable shields to chassis and legacy units is to use the clean/dirty box method described above. The individual 19” rack units occupy the “clean” volume and all connections to external parts of the system are made in the “dirty” volume. Apart from the notes on cable runs already discussed, there are no special rules for connections between the backplate/bulkhead connectors and components that bond I/O cable shields to chassis, except that shielded cables should be correctly terminated at both ends. This is to ensure that the maximum number of earth/ground bonds exist between the device and the earth/ground reference for the rack, at the bulkhead. Mesh grounds are always better for control of high frequency interference. (i) All shields of external cables to the enclosure to be 360 degree bonded to the bulkhead. (ii) Balanced I/O connections between bulkhead connectors and legacy units are made using unshielded twisted pair cables. (iii) Audio input connections must be filtered. (iv) Unbalanced audio I/O connections between bulkhead connectors and legacy units must be made via electronic or transformer balanced interface. (v) Unbalanced data or control I/O connections (RS 232 etc.) between bulkhead connectors and legacy units, should be made using multi-core cables with no overall shield, if possible. Note that certain unbalanced data I/O configurations use separate shielded cables for data in and data out. In such cases it is necessary to terminate one shield at the legacy end and the other shield at the bulkhead end. Decisions about which shield to connect at which end are unlikely to be trivial. Information on this should be available from the manufacturer. 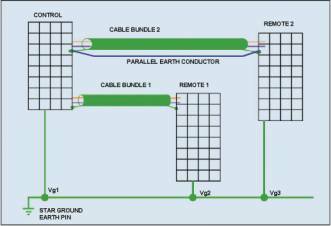 (vi) Unbalanced data or control I/O cables must be filtered. (vii) All unshielded filter components should be mounted as near to the connectors as possible on the “clean” side of the bulkhead. The earth/ground reference for the filter components must be bonded to the bulkhead. Shielding is a very important aspect in EMC equipment and system design. Unfortunately, there are so many variables that can affect shielding performance even in an ideal geometrical situation, the best advice is to note the limitations of a practical conductive barrier so that an informed choice can be made for a particular shielding solution. At low frequencies (below 100kHz), it is very difficult to create an effective shield from magnetic fields. Only materials with a high permeability are really effective, and these materials are usually too expensive for use in enclosure construction. However, low frequency electric fields are easy to deal with and almost any metallic material will provide an effective shield. At high frequencies (above 100kHz), most metallic materials are effective whatever the field source, because of absorption. Generally, absorption increases with the thickness of the barrier material, but this is less important for electric field shielding. A shielding barrier relies on current flow within the body of the barrier material, or, at high frequencies, near to its surface. The current flow provides the mechanism for absorption losses, and thus any interruption of the current flow will affect the shielding effectiveness. All shielding enclosures will have discontinuities that interrupt the current flow due to joints between structural members and panels, windows and access doors. Any practical equipment enclosure will have small openings for displays, connectors, controls, ventilation holes. Never-the-less, effective shielding is possible if the following precautions are taken. Any discontinuity or seam should be treated with a conductive gasket, if its longest dimension is greater than a tenth of a wavelength at the maximum frequency of concern. Internal placement of wiring and modules should avoid such apertures or seams. Critical or sensitive items should be placed as far away as possible from large apertures. Bonds should be made surface to surface at frequent intervals, or continuously along a seam. Bonding between parts requires that any paint, anodizing, or other insulating finish be removed. Positive pressure is required to make a bond. Where the gap between two fasteners does not allow the pressure to be maintained – fill it with a conductive gasket. Protect a bond from corrosion by making it gas tight and protecting it from water and other liquids. Bonding straps are preferable to wire connections, but both are very inferior to direct metal-to-metal contact over an area. Note that non-bonded joints will degrade both shielding effectiveness and transfer impedance. Aluminum and steel can be successful shielding materials. Aluminum particle loaded elastomer gives excellent results for passivation in military shielding tests. Compared to aluminum, steel is marginally better below 100kHz, but marginally worse above. Optimum metals for gaskets include nickel, monel and stainless steel. To reduce corrosion effects, it is best to select surface and gaskets from the same group of metals. For example, aluminum and brass should not be used together. Corrosion caused by galvanic action is a major problem. Electrochemical potential differences should not exceed 300mV. Cables entering or leaving an enclosure must have their shields properly terminated at the enclosure wall or bulkhead. This means 360 degree shield bonding. Unshielded cables should enter or leave via a suitable filter that provides adequate levels of attenuation at the frequencies that the shield is required to attenuate. Waveguide-below-cutoff tubes are useful for carrying non-electrical services and metal-free fibre optic cables through enclosure walls without compromising shielding effectiveness. fc = 150/d MHz, where d is one side of the tube opening in metres. SE = 27.3 * l/d dB, where l is the maximum internal width of the tube and d is one side of the square section tube aperture. The most effective of the ready made ventilation panels are the “honeycomb” type. This design is a direct application of the waveguide-below-cutoff principle. An assembly of small diameter metal tubes, the whole being electrically bonded to the enclosure shield all around its periphery, gives excellent ventilation and provides much better shielding than a mesh of plain holes. A viewing aperture is often the largest hole in a piece of equipment. The most effective type available is a glass or polycarbonate laminated with a wire mesh, the mesh being electrically bonded to the enclosure shield all around its periphery. In general, the purpose of a filter in an EMC context is to prevent interference from getting into or out of equipment via its cable interfaces. The conducted coupling is reduced directly, and this also helps reduce radiated coupling. Filtering at interfaces is really the responsibility of the equipment designer, but the system integrator/installer may need to consider filter design when designing the connections to legacy equipment or when dealing with telecommunications, data and signal ports that carry interference signals into and out of equipment. Luckily, EMC filters are available from a number of manufacturers in a variety of response characteristics to suit a wide range of interference frequency bands. While not universally true, unwanted interference is assumed to be at a higher frequency than the wanted signal. A conventional low pass filter circuit is used, built from two elements: series inductance and parallel capacitance. The most widely used configurations are the Tee and L filters. The choice of component types in the filter is determined by the frequency range to be attenuated. Note that a filter must be designed for the correct mode of interference present (differential mode or common mode). A filter that is attenuating the wrong mode will be ineffective, however good it is – and this fact can be a useful diagnostic device. A simple L filter can be used for differential and common mode interference. In the differential mode configuration, the series impedance is only required in one line and the parallel capacitor is connected across the two lines. For common mode interference, the series impedance is required in both lines, but now the parallel capacitors, one on each line, must be referenced via a low impedance, to a very good RF earth/ground - usually the chassis of the equipment being filtered. If a good RF earth/ground reference is not available, then the capacitors should not be used. (i) The magnetic flux due to differential mode current cancels in the core, thus a given core size can handle larger signal or power currents without saturating, giving greater attenuation. (ii) The windings are not seen by the signal current, therefore a filter can be arranged to attenuate in-band common mode interference, without affecting the desired signal. Note that capacitors, which are connected across each line and earth/ground on the clean side of the interface, can be added to improve or change the characteristics, but can make a large impact on the high frequency response of wideband circuits. This means that their values may need to very small, or they may not be able to be used at all. For low frequency, low impedance signal and power circuits there are no such restrictions. The bifilar filter can be used on input and output circuits, and for analogue or digital signals. 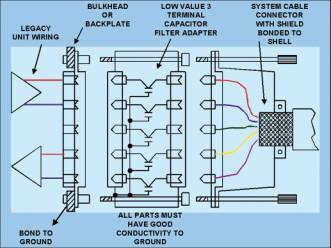 Making the right selection for a commercial supply filter, the type that is installed between the AC power supply and the AC/DC converter of a typical DC power supply, can pose a major problem. The performance of any filter depends on the impedance seen at its terminals. The impedance of the AC supply can vary from 2 to 2000 ohms, depending on the loads connected to it, the nature of the supply transformer and the wiring to the supply outlet. The impedance of the AC/DC converter varies from a few ohms to millions of ohms. This can rule out the use of single stage filters since their attenuation performance can worsen significantly when their input and output impedances are not 50 ohms. Indeed, such filters can produce gain rather than attenuation. Filters with two or more stages are able to maintain an internal circuit node impedance that does not depend too much on input and output impedance. Such filters are, of course, larger and more expensive. Responsible manufacturers of high performance supply filters publish the differential mode (symmetrical) performance data for both “matched” and “mismatched” source and load, in accordance with CISPR 17 requirements. These performance figures are usually shown graphically as filter attenuation versus frequency, where matched impedance means 50/50 ohms and “mismatched” means 0.1 ohm source, 100 ohm load, and vice versa. It is possible to estimate the performance of a given filter from these data. (i) The filter is part of the protection offered by the zone barrier. If the filter is located away from the barrier, interference will breach the barrier. (ii) A filter must have a high integrity earth/ground reference if a good high frequency performance is to be achieved. The zone barrier, will either be the shielding wall of an equipment enclosure, a bulkhead/backplate in an enclosure, the entry to an earth/ground mesh, a large metal plate used to bond to a MESH-CBN, or other similar locations (see ), and thus will be a direct connection to earth/ground. Most commercial filters are housed in a metal container that also forms the filter’s earth/ground connection. A filter with an integral input connector, such as an IEC inlet filter, can be mounted through the barrier. A filter that is supplied with input and output terminals, should be enclosed by an additional shielded (“dirty”) box. Telecommunications, data and signal connectors are often found to be conveyers of interference into and out of equipment. Such problems are now common place, since wideband digital circuits used in many of today’s products produce copious amounts of internal noise which tends to exit via I/O cables as common mode interference with a very much higher frequency content and amplitude than would be expected. Common mode filtering, and/or cable shielding may be applied to frequencies within the desired frequency spectrum, but if the conducted or radiated interference is caused by the essential spectrum of the signal, then differential mode filtering is not practical. While the basic filtering of such problems should be the responsibility of the equipment manufacturer, the system integrator or installer must be ready to make improvements where necessary and to initiate modifications to legacy or non-compliant devices. Filter adapters for many common connector types are now commercially available. The filtering in the majority of adapters is simply parallel capacitors on each line to earth/ground, using the shell as the reference conductor. Plainly, such a filter adapter will only work properly if the equipment has the shell of its I/O connector correctly RF-bonded to its chassis. If there is no such connection, or the equipment has a plastic case, no filtering will be provided and the capacitors will form a high pass interconnection between all pins on the connector. Multiply the cable length by the conductor capacitance to shield and subtract this from the overall drive capacitance specification of the equipment. Additional attenuation of common mode interference currents can be provided by the use of the ferrite sleeve. The placing of any magnetically permeable material around a conductor increases the flux density for a given field strength and therefore increases the inductance. “Soft ferrite” is a particularly suitable material, since its permeability is complex and it behaves like an inductor at low frequencies and a series resistor at high frequencies. Its lossy resistive behaviour discourages resonance’s and makes its attenuation more reliable as a result. . Attenuation of between 6 to 10dB can be expected, so fitting a ferrite sleeve may well be the difference between pass/fail and/or reliable signal/unreliable signal in circumstances where the equipment or the interference is on the limit. Placing a ferrite sleeve around a complete cable will have no effect on differential mode noise or signal currents. However, common mode currents in single and multiple conductor cables or the shield of shielded cables will be attenuated. Of particular interest at system level is the range of split tube ferrite components, with a plastic “clip-on” housing. These components are available in many different sizes for use with round and ribbon cables. Although ferrite impedances are limited to a few hundred ohms, the impedance for a given core material is proportional to the log of the ratio of outside to inside diameter and directly proportional to length. This means that maximum attenuation will be achieved if the ferrite sleeve fits close to the cable and is as long as possible. The ideal location for a ferrite sleeve is as close as possible to the equipment or connector. “Bonding cable shields at both ends to reduce noise”, Keith Armstrong and Tony Waldron, EMC Compliance Journal, May 02 (www.compliance-club.com). The final part of this article will appear in the next issue of the EMC Compliance Journal - Issue 43, November 2002.